Thanks to Mt. 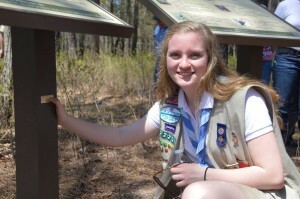 Laurel resident and Girl Scout Gold Award recipient Victoria Ieradi, it’s now even easier for locals to learn more about one of South Jersey’s greatest natural resources — the Pinelands. 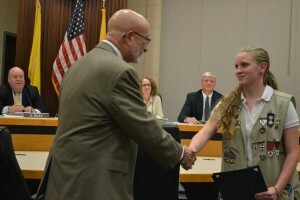 For her Gold Award service project, the now 18-year-old Lenape High School senior helped improve the Pine Tree Educational and Environmental Center in Tabernacle by researching, designing and installing 27 educational signs detailing plant and animal species unique to the Pinelands area. Those same signs also contain QR codes for visitors to scan with their mobile devices, which will then direct them to a website also featuring that information for future reference. The Gold Award is the highest achievement within the Girl Scouts of the USA, earned by senior and ambassador Girl Scouts. According to the Girl Scouts of America, only 5.4 percent of eligible Girl Scouts successfully earn the Gold Award. Ieradi said the idea to do something at Pine Tree originated from a playful challenge from her brother, an Eagle Scout himself, who said she should do something for a Boy Scout camp because it had always seemed Boy Scouts were doing more projects for Girl Scout camps than Girl Scouts were doing for Boy Scout camps. Ieradi said her brother went to the Cub Scout camp at Pine Tree when he was younger, and when she returned as a freshman in high school looking for a project, she learned about the sign project and thought it was a great idea. “I went to Pine Tree and they already had the project approved by the NJ Pinelands Commission, so the project was already set to go in, they just needed someone to do it,” Ieradi said. Ieradi explored the area with the camp ranger and learned the locations they already had in mind for the signs, and when it came time to dig, she just chose a location that was the most convenient for viewers to find. For the information on the signs, she had to contact plant and animal specialists, as well as research on her own regarding the different plants and animals that inhabit the nine ecosystems along where the signs would go. The project totaled 1,280 hours, 360 of which Ieradi completed herself. Despite many girls leaving Girl Scouts by the time they’re high school age, Ieradi said she wanted to get her Gold Award because she had been in Girl Scouts since she was in kindergarten and believes Scouting to be an important aspect of her life. Ieradi even received a proclamation from the Mt. Laurel Township Council commending her on the achievement at its Nov. 9 meeting. In addition to her Gold Award, Ieradi also previously received The Silver Award in the Venturing program of the Boy Scouts of America, which was the highest award in the program through 2014 before being replaced by the Summit Award. After high school, Ieradi said she hopes to attend Arcadia University and study physical therapy and compete on the university’s swim team.